Police were called by paramedics to an address in Yaxley near Peterborough at about 1.45am on Sunday following concerns a baby boy had been attacked by a dog. Cambridgeshire Police said on Tuesday the boy remained in a critical condition in hospital. A 31-year-old man and woman, 28, both from Yaxley, were arrested on suspicion of child neglect and bailed until December 15, the force said. Two Staffordshire Bull Terriers were taken from the property and placed in police kennels. 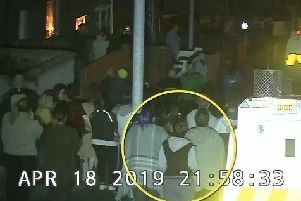 There was no police presence near the flat in Wykes Road on Tuesday and the pair who live there, believed to be Daniel McNulty and his partner Amy Litchfield, were not at the address. A man at the property, who did not identify himself, said: "They're in bits, they're devastated." He described the incident as a "freak accident", adding that the dogs have "never been dangerous, they've been docile dogs". He said the man and woman were "at the hospital". The boy was initially taken to Peterborough City Hospital with life-threatening head injuries, and later transferred to Addenbrooke's Hospital in Cambridge where he remains.